Reiki is an energy healing for stress reduction and relaxation that also promotes physical and spiritual healing. Reiki is based on the idea that “life force energy” flows through us. If one’s energy is low or blocked for any reason, then we are more likely to get sick or feel stress, and if one’s energy is freely flowing, we are more capable of being happy and healthy. A session feels like a glowing radiance that flows through and around you. Reiki treats the whole person including body, emotions, mind and spirit. There are many beneficial effects such as relaxation and feelings of peace, security and well-being. Many have reported miraculous results. Reiki is a natural and safe method of healing that can benefit many. Reiki can do no harm. Studies have been published illustrating the effectiveness of Reiki in managing pain (Jahantigh 2018) and providing improvements in common cancer-related symptoms (Marcus 2013). It also works in conjunction with other medical or therapeutic techniques to promote recovery and relieve side effects. We are alive because life force is flowing through us. Life force flows within the physical body through pathways called chakras, meridians and nadis. It also flows around us in a field of energy called the aura. Life force nourishes the organ and cells of the body, supporting them in their vital functions. When this flow of life force is disrupted, it causes diminished function in one or more of the organs and tissues of the physical body. The life force is responsive to thoughts and feelings. It becomes disrupted when we accept, either consciously or unconsciously, negative thought or feelings about ourselves. These negative thoughts and feelings attach themselves to the energy field and cause a disruption in the flow of life force. This diminishes the vital function of the organs and cells of the physical body. Reiki clears, straightens and heals the energy pathways, thus allowing the life force to flow in a health and natural way. There is no wrong way to experience Reiki. Some people feel a tingling sensation where the energy is flowing; possibly warmth or coldness in hands and feet. Some people feel their tensions release instantly and some may feel it later, but the healing is always working in subtle ways. A deep sense of relaxation ensues, which makes some people feel a little sleepy and puts others into a deep trance-like sleep. Upon finishing a session you can expect to feel a senses of calmness, self-compassion, peace, and joy. When seeking a definition from a more spiritual context, we find that Rei can be defined as the Higher Intelligence that guides the creation and functioning of the universe. Rei is a subtle wisdom that permeates everything, both animate and inanimate. This subtle wisdom guides the evolution of all creation ranging from the unfolding of galaxies to the development of life. On a human level, it is available to help us in times of need and to at as a source of guidance in our lives. Because of its infinite nature, it is all knowing. Ki is the non-physical energy that animates all living things. Ki is flowing in everything that is alive including plants, animals and humans. When a person’s Ki is high, they will feel strong, confident and ready to enjoy life and take on it’s challenges. When it is low, they will feel weak and are more likely to get sick. We receive Ki from the air we breath, from food, sunshine and from sleep. It is also possible to increase our Ki by using breathing exercises and meditation. When a person dies, their Ki leaves the physical body. Ki is also the Chi of China, the prana of India, the Ti or Ki of the Hawaiians, and has also been called the odic force, orgone, bio-plasma and life force. 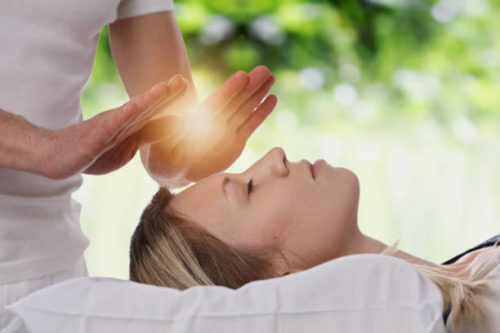 With the above information in mind, Reiki can be defined as a non-physical energy made up of life force energy that is guided by the Higher Intelligence, or spiritually guided life force energy. This is a functional definition as it closely parallels the experience of those who practice Reiki in that Reiki energy seems to have an intelligence of its own flowing where it is needed in the client and creating the healing conditions necessary for the individuals needs. Because Reiki is guided by the universal-consciousness, it can never do harm. It always knows what a person needs and will adjust itself to create the effect that is appropriate for them. One never need worry about whether to give Reiki or not. It is always helpful. In addition, because the practitioner does not direct the healing and does not decide what to work on, or what to heal, the practitioner is not in danger of taking on the karma of the client. Because the practitioner is not doing the healing, it is also much easier for the ego to stay out of the way and allow the presence of the universe to clearly shine through. We offer 15, 30 and 60 minute sessions. We do recommend coming 10 minutes beforehand to allow yourself to get ready and relaxed. Wear whatever you are comfortable in. Which means to take off layers if you are too hot or put on layers if you are too cold. All healers use life force or Ki, but not all use Reiki. Reiki is a special kind of life force that can only be channeled by someone that has been attuned to it. It is possible that some people are born with Reiki. However, most healers who have not received the Reiki attunement from a Reiki Master are not using Reiki. Our practitioner Beth has been attuned by a Reiki Master in the Mikao Usui tradition and lineage, and is therefore certified to practice Reiki. Who will be instructing the class? Beth Sauter is a new member of our team at Synergy. She graduated in May of 2017 from George Mason University where she majored in Hospitality Management but also studied Consciousness and Well-Being. She is a newly certified Reiki Practitioner- Beth believes that Reiki is beneficial for absolutely everyone! She works to genuinely embody her personal ideals of Joy, Empathy, and Connectedness in effort to heal her clients’ in mind, body, and spirit. Can I give a Reiki session as a gift?